NEW - ERS launches the myPhone Hammer range of rugged smartphones built for busy mobile workers. Established in 2008, Hammer is a sub brand of myPhone - a Polish manufacturer of smartphones that are currently being sold in 17 countries. The range includes the premium AXE PRO, professional AXE M, ENERGY and entry level IRON 2, all designed for mobile workers whether they are technicians, couriers, field sales, construction workers or simply employees who require a more robust smartphone. Built to look and feel like a consumer device, the Hammer range offers users the familiarity of operating an Android smartphone but comes with the benefits of a rugged device. With the latest Android 7.0 operating system, powerful business processors and long life batteries, your workers can multi-task and use the device for data intensive operations. Protection from dust and water is achieved with an IP68 rating and a 1.5m drop spec safeguarding from knocks and drops. 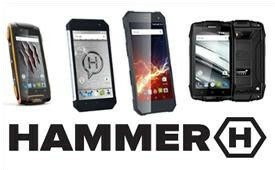 Hammer phones plug the gap between consumer smartphones and industrial handhelds, their competitive price point can provide your business with a low initial investment compared to traditional rugged handhelds but still enable users to work to a high standard. myPhone is one of eight European manufacturers, who have been honoured with the Android European Award from Google. All current myPhone devices have Google Mobile Services (GMS) certificates, this guarantees legitimate access to applications such as Google Playstore and Maps for all myPhone users. For More Information click here or call our sales team on + 44 (0) 1234 855300.